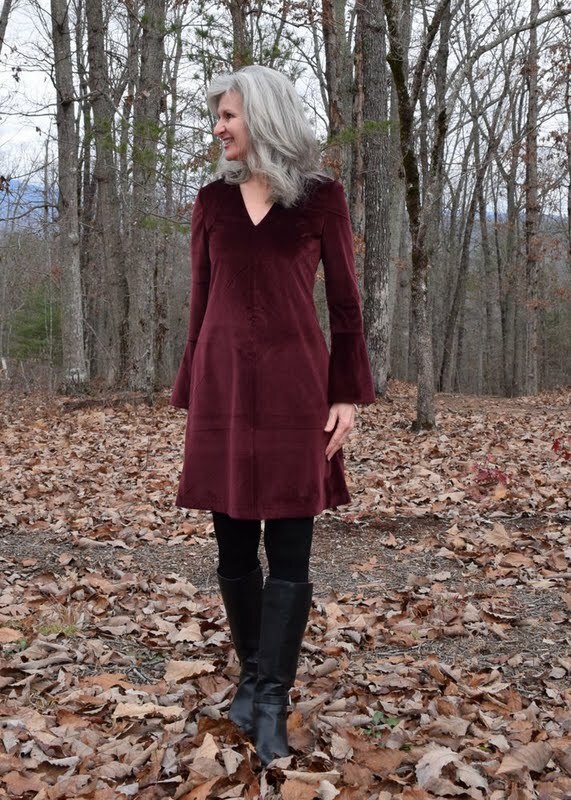 After years of dreaming of sewing a Christmas Dress for myself, a dress was made this year. 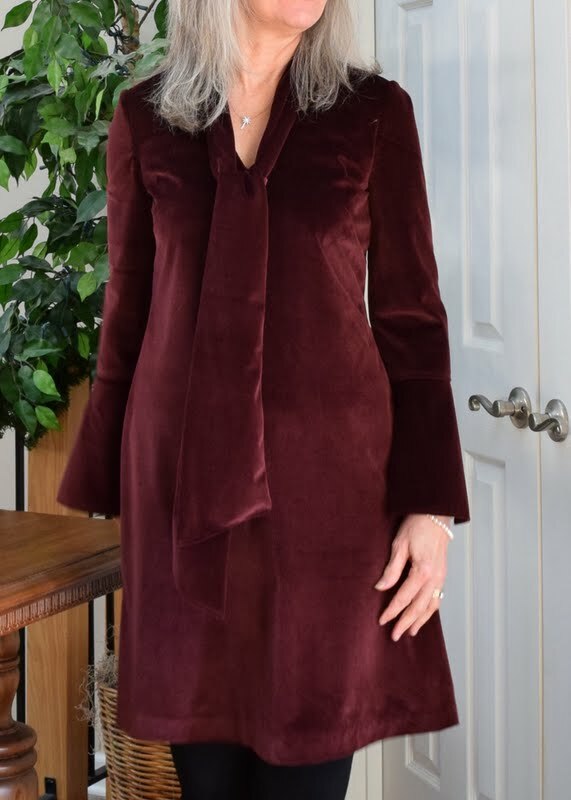 And finished in time to actually be worn to Christmas events, even though the last seam was sewn in the wee hours of the night before Christmas Eve day. Whew! These photos were taken after we had eaten lunch after attending our Christmas Eve morning church service. The dress was also worn to our evening Christmas Eve Service. My friend, Paisley Pirouette creates a beautiful Christmas dress for herself each year, and I have admired her work and longed to do the same for the longest time. She made the prettiest dress again this year you can see here. We both realized on Instagram, after each of our dresses had been made, that we had chosen the same color of fabrics! Love that thought! Love this dress in spite of the ruching effect around the zipper. But we'll talk about all that in a minute. 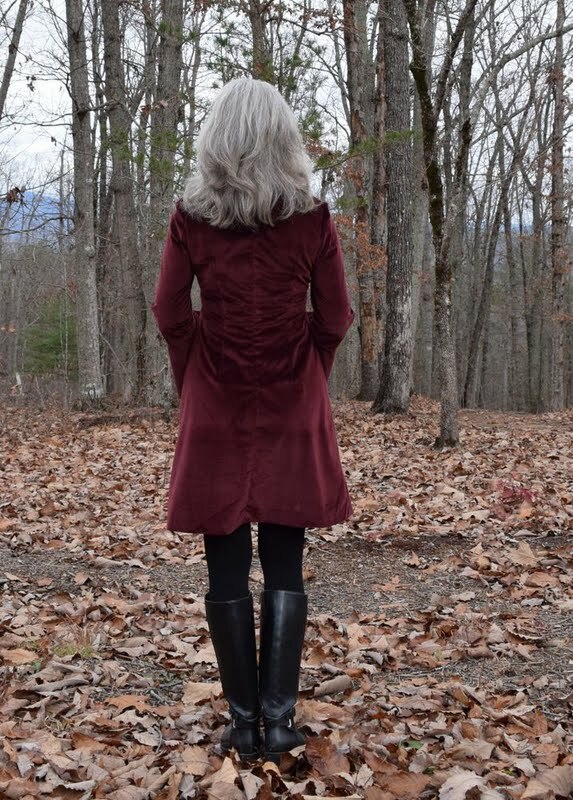 As you can see we are in our 'winter' view of the woods and mountains and it was briskly cold this Christmas season. 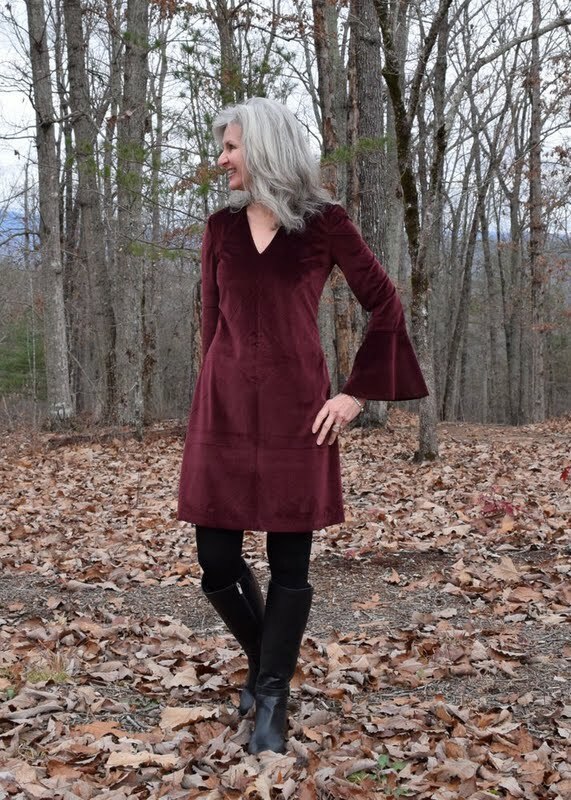 When I first saw this pretty bell sleeved dress pattern in Burda's 12/2016 issue, I just knew it needed (it had!) to be my 2017 Christmas Dress. Burda shows 3 different ways to make this versatile pattern..... a tunic, a dress and a maxi dress. Burda also shows 3 adaptations of the neck/collar with a choker type of collar, tie collar or simple v-neckline collar. 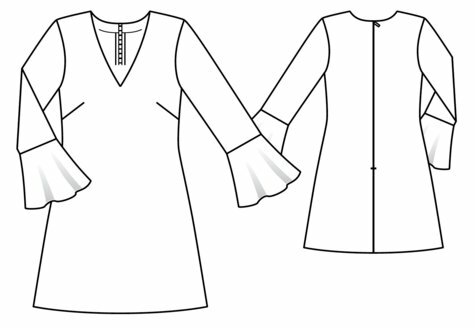 Burda also includes 2 different sleeve patterns. I made #112 the Bell Sleeve Dress with the simple v-neckline. You can see more about this pattern at Burdastyle.com. (Photos below credit to Burdastyle.com ). In September 2017, it was immediate 'love' when I felt this lovely velvet-y corduroy wine-colored fabric in Joann Fabric Store and felt it would be perfect for my Christmas dress. 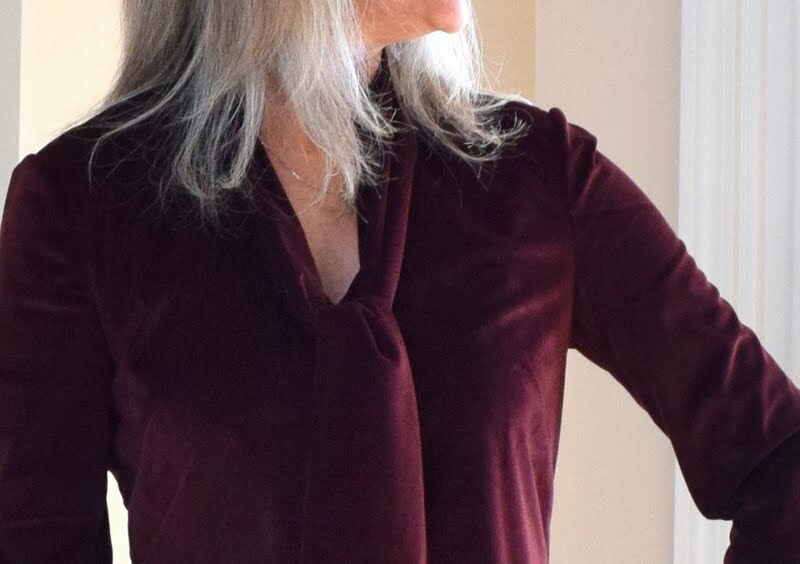 This pattern is for a stretch knit and for some strange reason I thought this corduroy had some 'stretch' in it when picking it out in the store, but in the middle of making my dress became very aware that there is nary any stretch to speak of. After referring to my photo below that I snapped in the store the day of purchase, I must've been in some sort of fabric fog when I purchased this, as there is clearly no stretch content noted in this fabric. Thankfully it still worked okay for this pattern. The dress was ironed for these photos this morning and looks much better than the earlier photos. Btw, this velvet-corduroy irons beautifully. With your iron on a lowered heat setting and using a press cloth be sure to iron in the direction of the nap, and do not 'over-iron'. And here is the final result. I cut a size 36 at the bust and waist, grading to a size 38 at hips. Added 1" to the length and included the vertical back darts option on the back pattern piece for a more fitted look. Hem depth was 1 1/4" blind hem stitched by machine. 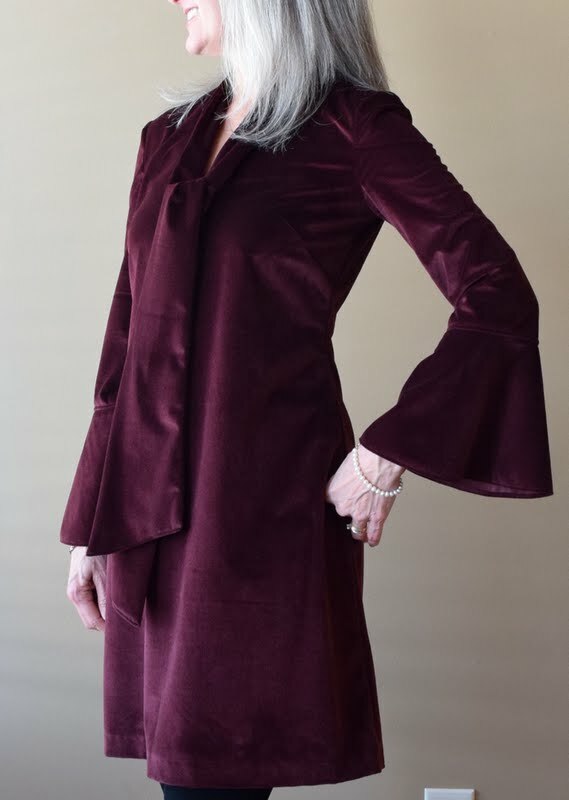 I ended up making the tie collar later Christmas Eve day and love it! The collar is not attached to the dress at all, yet stays nicely 'put' and in place and really adds to the overall design look of the dress methinks. I have a confession. For some reason, even though this dress was planned almost 12 months in advance, it was not cut out until a few days before Christmas Eve day. Thank goodness it was a fairly easy and quick garment to make. This fabric was a dream to sew. Though I had sampled the serging stitching before serging my fashion fabric, and felt I had made the correct adjustments on my serger, the serging seemed to gather the fabric on the center back fabric's raw edge, which was my first pass through the serger with the fashion fabric. Under such a time constraint I went ahead and put the invisible zipper in hoping the wrinkles could be ironed out later. Nope. None ironed out, so decided to leave everything as is and consider the back a 'design' detail. ;) After that all the other 5/8" seams raw edges were left unfinished and they do not unravel nor curl. Nice. The dress is unlined and a lining might keep it from 'catching' on my tights every so often, like when I was trying to imitate the model's exuberant jump, below. Ha! :) It's not too bothersome, so I'm not worrying about it now. There's no way I could've finished this under my self-limiting time constraint if I'd taken the time to put in a lining. There are a couple of things I'd like to point out. 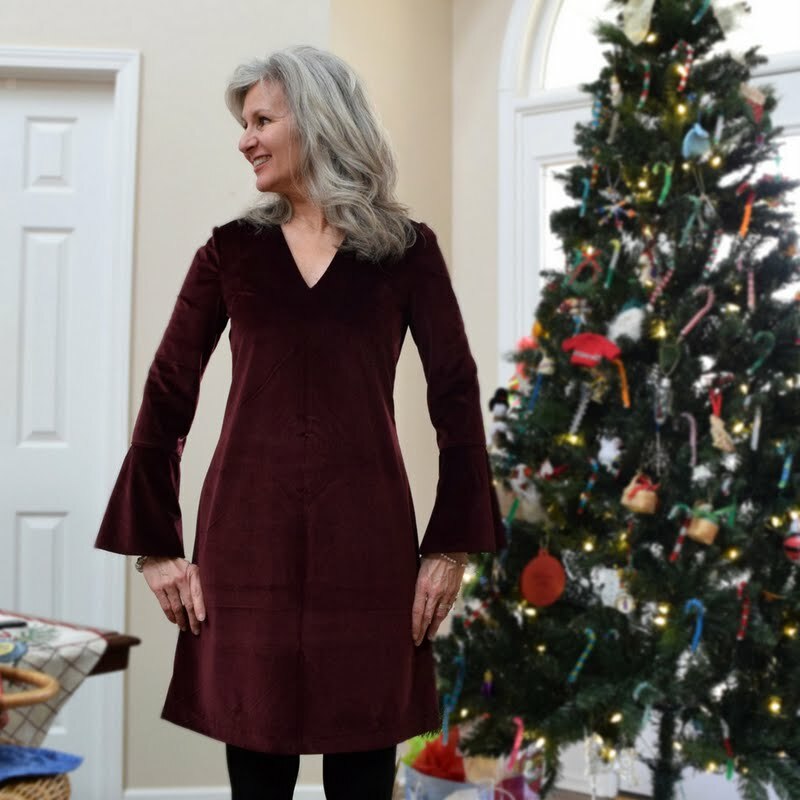 After wearing the dress for the first time all Christmas Eve day, it felt odd through the front sleeves armscye and tight in the back. You can see the wrinkles where the front of the sleeves are pulling in the photo below. You can also see the additional wrinkling/pulling from the back at the waist. 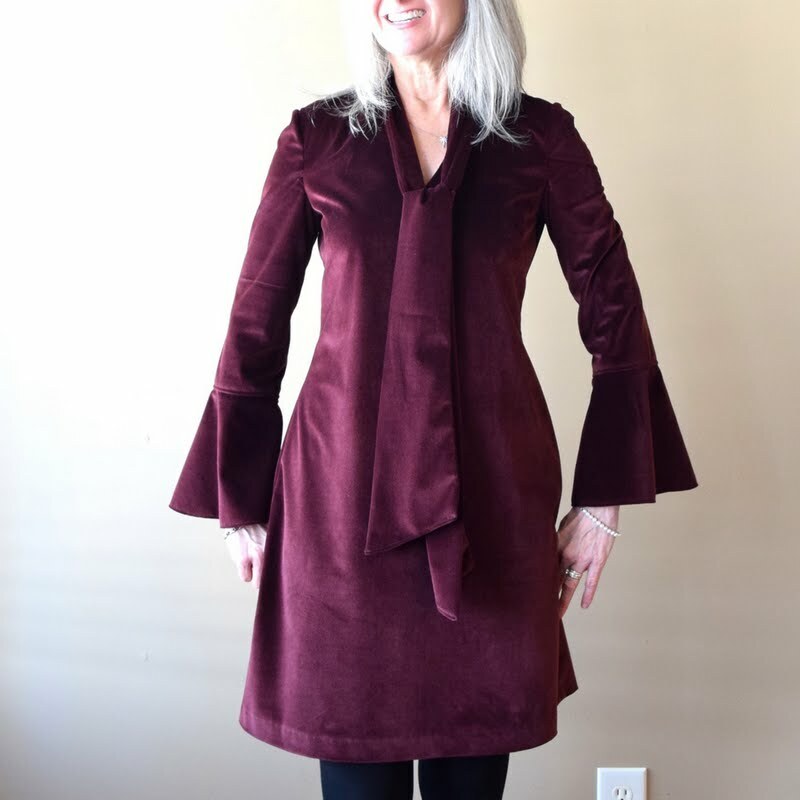 At first I thought it was a fitting/sleeve insertion failure but after looking more closely at Burda's modeled photographs as I write this post, am beginning to think it may be a pattern issue. The models all show pulling in the exact same sleeve area as mine as well as wrinkling in the waist back area. This was pretty much made with no modifications, with the exception of the sleeves. They are made for super skinny arms! Ordinarily I do not have any width of sleeve problem in the bicep area, but I could hardly even get these on with a 5/8" seam allowance. Ripped that out and took a mere 1/4" seam allowance and it is bearable. Snug but bearable. Even though Burda's instructions do not have you understitch the neckline facing, please do. It helps the neckline facing to lie nice and flat. Oh, I also stay-stitched the entire neckline first too. Actually that's one thing I do like about Burda's meager instructions, it makes me 'think' and apply skills I've learned along the way. 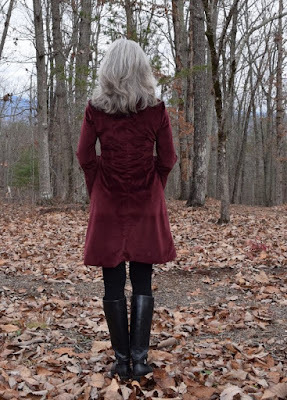 It was refreshing to actually finish a garment project for me and complete a garment for the Make a Garment a Month Challenge at the same time. I so enjoy participating in this monthly challenge, but have not been so good about completing lately. 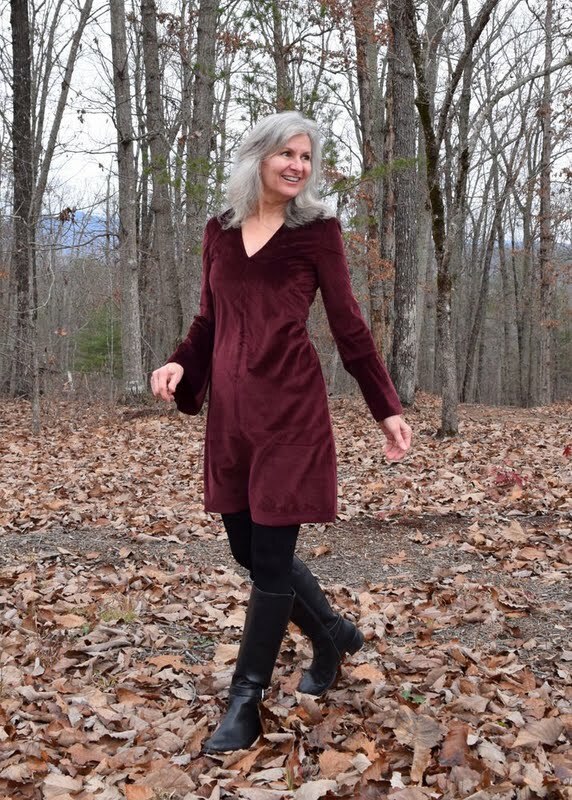 Sarah Liz is our lovely hostess and she's already published a post for the 2018 Make a Garment a Month Challenge if you think you might be interested in participating too. And December 2017's MAGAM Challenge was all about copying a Designer RTW garment that also doubled as a Designin' December garment challenge hosted by the lovely Linda who blogs at Nice Dress! Thanks, I made it! These photos, below, of an Antonio Melani dress in our local Dillard's Department Store were the inspiration for my dress. 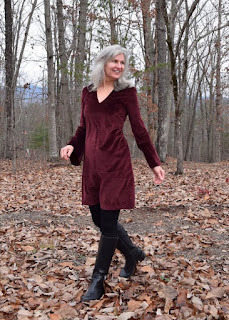 Overall this dress is everything I wanted in a Christmas Dress..... nice enough for church, but casual/sporty enough for daily life.... particularly when paired with a black suede zip-up jacket, black tights and boots. A perfect Christmas dress Lisa. I absolutely love it. Yes! The "wrinkles" at the back next to the zipper look like they were meant to be a design element. When you wear this beautiful dress, don't you dare point out the fact to anyone that it 'twas not meant to be that way! Lisa, you could have been the model for this dress pattern. The dress (and you in it, of course!) is gorgeous. What a wonderful color on you. It's no wonder you fell in love with it at the store. Isn't it nice to realize all your past experiences help you fill out the sparse instructions and result in a good looking garment? The tie was a great addition. Happy New Year, Lisa. I look forward to following your adventures in 2018 and beyond. Oh yes, it is a perfect dress for so many occasions. I love a dress that can be dressy but also made out of a fabric that can be worn on a daily and more ordinary setting. It really is lovely - and having a tie collar that you add or substract certainly creates lots of options. And yes, always understitch a neckline facing. Strange that your fabric puckered - I wonder why. I have had similar issues occasionally, and just live with the results. Thank you for your lovely comments about Make a Garment a Month...it keeps me on my toes nowadays, I can assure you! P.S....I could not do Make a Garment a Month without the help of all of you wonderful people. I am so keen to make a velvet dress after seeing your lovely version. This is such a beautiful dress and perfect for Christmas. 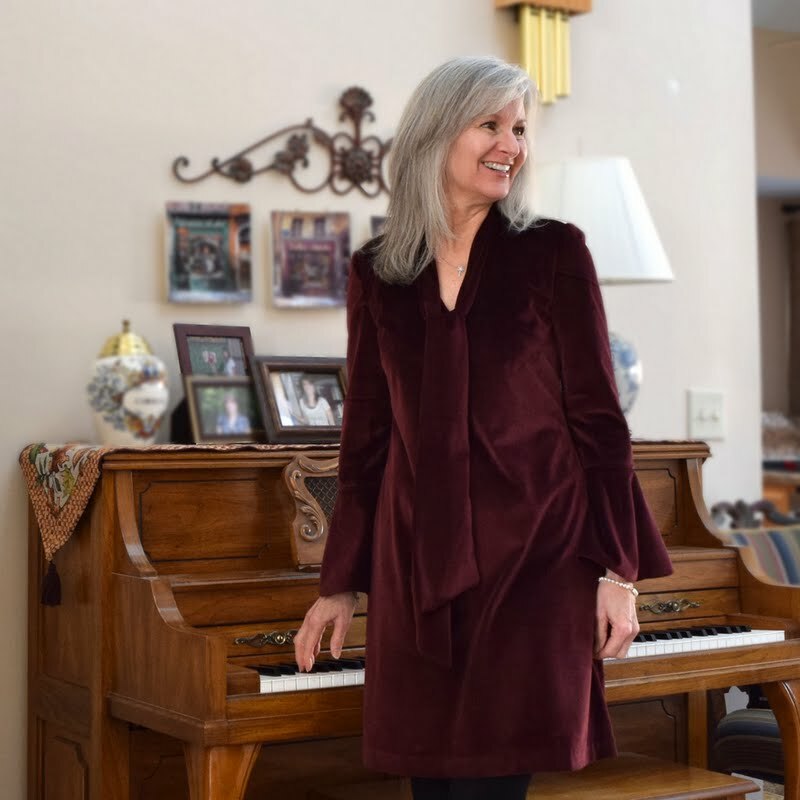 Dear Lisa, you look so lovely in this gorgeous Christmas dress! I had immediately read and commented your post, but it seems that comments aren‘t taken with my laptop. Thank you so much for mentioning my Christmas dress sewing. It is such a nice thing we sewed up the same colour this year. None of the little misshaps you are telling about can be seen. (I guess that it is all about the „wrong“ fabric type. Patterns for stretch knits are often designed with negative ease, hence the tight sleeves. I think you are really slender when wearing his in a non stretch( woven ;) ) Your dress looks chic and young and very wearable. The scarf was a good idea. Wising all of you a happy and healthy New Year and I hope tat you will have a lot of time for sewing! This is gorgeous! It is a very flattering dress and really suits you. I love the colour of the fabric and the sleeves!